The Electron has several different sleep modes available to help you reduce power consumption. 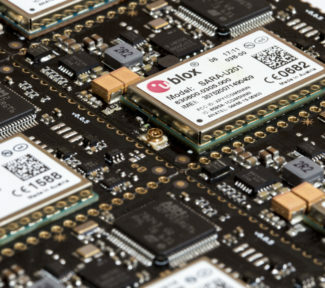 Choosing the correct setting for your project can make a big difference in the amount of battery usage, data, and time to connect. While there isn’t one best method for all applications, I’ve written up some notes and tips on how you can figure out what’s best for your use. The short of it is, the key to picking the right setting mostly depends on the amount of time you plan to keep your device asleep. I’ve also written a wildly inaccurate power consumption calculator that you can use to get a wild guess of how long a battery will last and how much data it will use. Note: Updates to this document can be found [on Github](https://github.com/rickkas7/electron-power-data-usage) along with the test code. All were tested in 0.7.0 on an Electron 3G Americas (U260) with system threading off. †There is also `SLEEP_MODE_DEEP` with `SLEEP_NETWORK_STANDBY` but I can find no discernible difference vs. regular `SLEEP_MODE_DEEP`. Both use 161 μA and both require a cellular reconnection when waking from sleep. In any of the mode other than stop mode (pin + time) with SLEEP_NETWORK_STANDBY it’s necessary to reconnect to cellular after waking up from sleep. This is the blinking green phase. This takes between 24 and 60 seconds (or more) so this will affect your energy usage. It doesn’t affect your data usage, however, as connecting to a cellular tower doesn’t count against your data usage. This graph might be a little low, as really short spikes in power usage were likely missed by my meter but it’s a reasonable approximation. Y axis is amps. I use amp-seconds because the numbers are a reasonable size and are a logical measurement as I measure the number of amps many times per second, so I can take the average, then multiply by the number of seconds to get the total amp-seconds. You can convert this to other more common measurements like amp-hours by dividing by 3600, or watt-hours by multiplying by 3.6V and dividing by 3600. 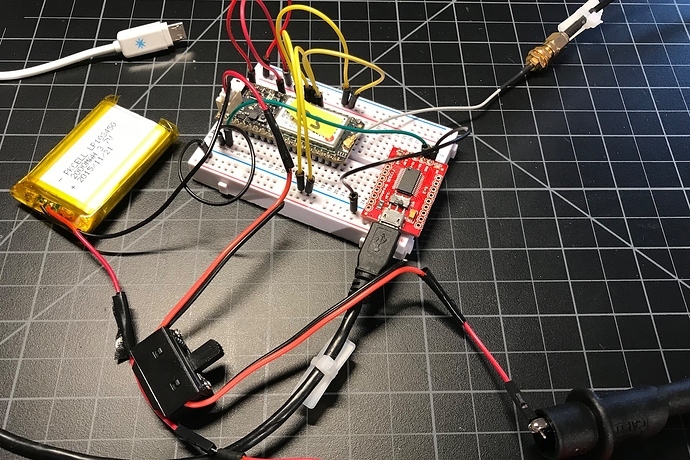 Using stop mode sleep (pin + time) with SLEEP_NETWORK_STANDBY can save time and power by eliminating the need to reconnect to the cellular network, the blinking green step. 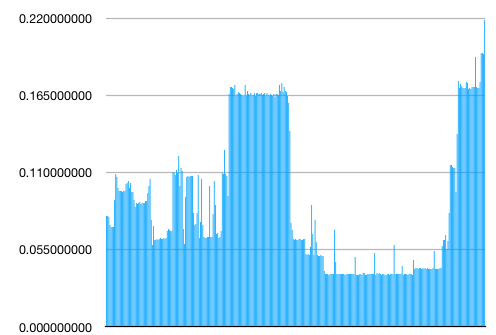 The average idle power consumption is 6.53 mA, but it really is about 4.5 mA with occasional spikes; these are where the cellular modem is communicating with the tower to keep the connection alive. Y axis is amps. Given the difference of 0.006240 A, it takes 334 seconds (about 5 1/2 minutes) of SLEEP_MODE_SOFTPOWEROFF to offset the energy used to reconnect to cellular. Of course if you need to wake up quickly, you may want to use SLEEP_NETWORK_STANDBY for even longer sleep periods, just to save the 24 to 60 seconds to reconnect to cellular. The only situation where you’d likely use stop mode sleep (pin + time) without using SLEEP_NETWORK_STANDBY is if you need to wake up to take a measurement frequently, but only upload those measurements infrequently (more than every 15 minutes or so). The full test of doing a publish (below) takes into account other areas of overhead which makes stop mode (pin + time) with SLEEP_NETWORK_STANDBY advantageous in even longer sleep durations. This is the blinking cyan and fast blinking cyan phase. However, in many cases the session can be restored instead of renegotiating it. This saves time, energy and data. This takes about 2.8 seconds and some data. Session restore works in all modes, stop (pin + time) and SLEEP_MODE_DEEP, and SLEEP_MODE_SOFTPOWEROFF. Also, session restore works even if you sleep longer than the keep-alive interval. This takes under a second and uses very little data. This typically happens when you use stop mode sleep (pin + time) without SLEEP_NETWORK_STANDBY. In stop mode sleep (pin + time) with SLEEP_NETWORK_STANDBY there’s no restore session session needed at all – you just continue where you left off from with no additional data used, when the sleep time is less than the keep-alive (23 minutes with the Particle SIM). 0000047242 [comm] INFO: Waiting for Confirmed messages to be sent. 0000051483 [comm] INFO: Waiting for Confirmed messages to be sent. Even after the device appears to have gone to sleep (status LED off, no more serial messages being emitted), it takes some time for the cellular modem to finish up and go to sleep when using SLEEP_NETWORK_STANDBY. The higher bars of 150 mA are about 4.5 seconds after the status LED goes off before then modem truly goes into idle state. This normally isn’t a big deal, however for very short sleep durations, say 10 seconds, you wouldn’t save nearly as much power as you’d think. This is the lowest power consumption. It is SLEEP_MODE_DEEP and also turns off the fuel gauge. I got power usage of 110 uA. One problem with this, however, is that powering off the fuel gauge causes it to lose its calibration. If you need accurate battery readings upon waking from sleep you should just use SLEEP_MODE_DEEP. Even though the idle current is much higher for stop mode sleep with SLEEP_NETWORK_STANDBY, the power requires to reconnect when in SLEEP_MODE_DEEP offsets this when the sleep is too short. Counting all of the overhead, when the sleep time is less than 12.6 minutes, stop mode sleep with SLEEP_NETWORK_STANDBY saves power. Publishing every 10 minutes, it would also save 215712 bytes per day! That would be the difference of 7.7 MB or being well under included 3 MB data limit in a month. I’m not sure why the above average power usage takes 12 seconds here and less when immediately sleeping, but it seemed to be consistent. 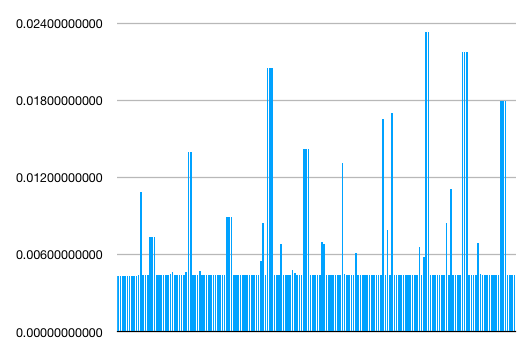 The operation in the debug log is short, but the power usage takes a while to return to idle levels. The other way of looking at it is that 12 seconds of idle usage is 0.68 amp-seconds, so the usage above average is only 1.2616 amp-seconds. 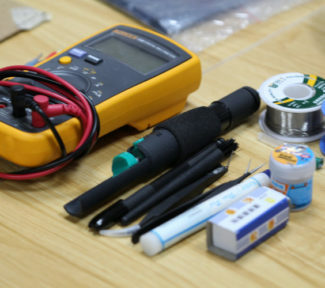 An Electron 3G Americas (U260) powered by battery with the current sensor inline with the battery power. The device is monitored by redirecting logging to Serial1, and the serial-to-USB adapter is powered by USB so it doesn’t have much of an effect on the Electron. The yellow wires are the test configuration wires, which determine which test to run by a binary value on D0-D3. 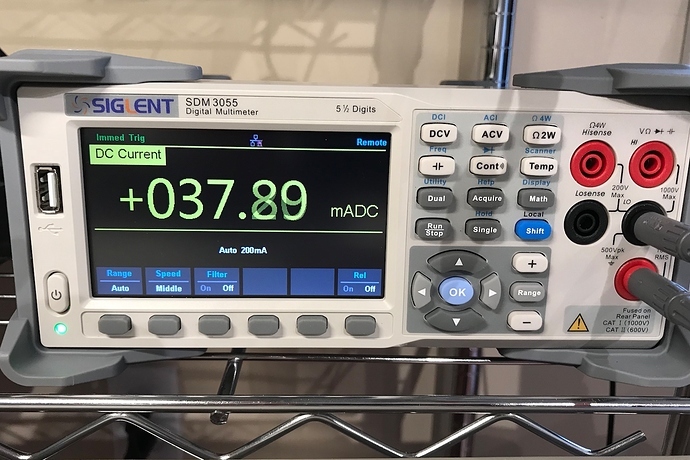 The current is measured by a Siglent SDM3055. It’s auto-ranging and has 4.5 digits of precision. 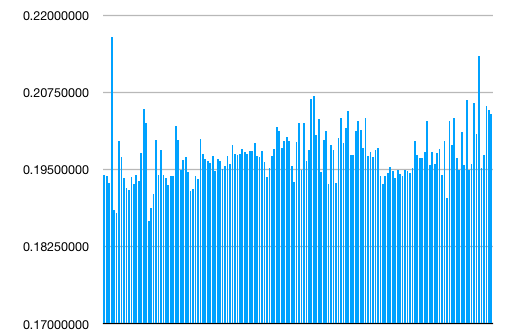 The important part is that I can capture the data in real-time over USB to a computer and save all of the values to a CSV file, which is how I calculated total usage and generated the graphs. In medium speed mode, I get a sample about every 0.06 seconds. Stop mode sleep (pin + time) with SLEEP_NETWORK_STANDBY is the best option. Sure, the idle consumption is 6.5 mA, which is a bit high, however, upon waking all of your variables are preserved, and you immediately begin execution of your code after the System.sleep statement. There is no extra data and no extra time waking up from this mode, so it’s ideal for low-duration sleep. Stop mode sleep (pin + time) with SLEEP_NETWORK_STANDBY is the best mode if you need very fast wakeup from sleep. You can wake and publish data in around 1 second. SLEEP_MODE_DEEP if you need to use the fuel gauge to check the battery when you wake up. SLEEP_MODE_SOFTPOWEROFF if you do not. For more on sleep states and for updates and the code I used in this post, head over to my git repository. And, if you have any questions, the forum is a great place to get answers. Happy power saving! 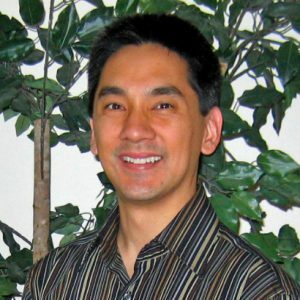 Rick Kaseguma is a collector of obscure knowledge about Particle products and enjoys hardware and software design, carpentry, and downhill skiing. Hi Rick! I enjoy all of your posts, especily this great tutorial is awesome, very clear and explicative. I made a lot of projects(all for Hobby) with Particles hardware and other Microcontrollers, starting with 68HC11 in the 90’s . At this moment I work in a remote rain gauge with the Electron, I need send the “counts” of the pluviometer (inchs or mm) in 15 minutes intervals. I use an interrupt for counting and I send the data to Thingspeak trought webhooks. But, I need to improve the battery life whitout lost the 15 minutes interval and the counts. This is probably best to discuss in the community forums (https://community.particle.io). But yes, this is possible. With 15 minute intervals you’ll likely want to use stop mode sleep (pin + time) with SLEEP_NETWORK_STANDBY. You’ll attach your rain gauge such that it will trigger the Electron to wake from sleep on bucket tip. However, you’ll want to use SYSTEM_MODE(SEMI_AUTOMATIC) so you will only connect to the cloud at the 15 minute intervals, not at every bucket tip. 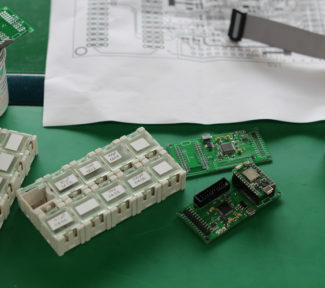 Learn the difference between prototyping and production hardware and how to build it.